Science is back with more sobering news about vaping. A letter published in the New England Journal of Medicine claims that vapor produced by electronic cigarettes contains a high concentration of formaldehyde, a known carcinogen. But don't panic quite yet. These types of experiments tend to be pretty controversial and basically divisive. We already knew from multiple past studies that e-cig vapor can include dangerous chemicals like formalehyde, not to mention awful-sounding crap like acetaldehyde, toluene, cadmium, nickel, and lead. The real question is how much, and does it mean vaping is dangerous, and does it mean it's just as dangerous as combustible cigarettes. We simulated vaping by drawing the vapor—the aerosol—into a syringe, sort of simulating the lungs. To our surprise, we found masked formaldehyde in the liquid droplet particles in the aerosol. We found this form of formaldehyde at significantly higher concentrations than even regular cigarettes [contain]—between five[fold] and fifteenfold higher concentration of formaldehyde than in cigarettes. Long-term exposure is recognized as contributing to lung cancer. That sounds bad. However, vaping advocates are quick to point out how the study simulated vaping, perhaps in a manner that's not entirely true to how people actually do it. There are many other variables in an experiment like this, like the brand of e-liquid or the voltage used. 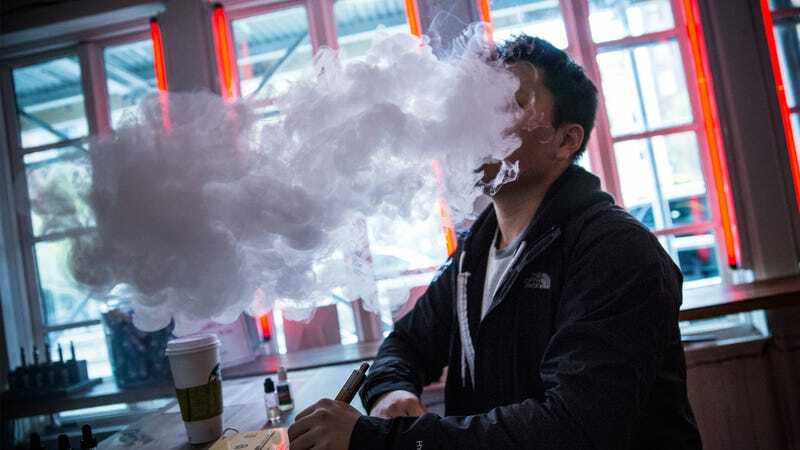 In other words, just because the scientists were able to find large amounts of formaldehyde in a vaporized e-cig liquid, that doesn't necessarily mean large amounts of formaldehyde fill the lungs of people who vape. What happens in the lab is not necessarily the same as what happens in the streets. We know cigarettes are damn dangerous. Vaping, however, is a newer thing that we know less about. More research needs to be done before the verdict on e-cig safety is in. That said, there is mounting evidence that shows how vaping isn't as safe as some like to think. Past studies show, for instance, that vaping alters cells a lot like smoking tobacco does.